Tristan Kerr, an Australian based artist, was asked to research and revisit the heritage of Cooper’s Alehouse, a pub located in South Australia. 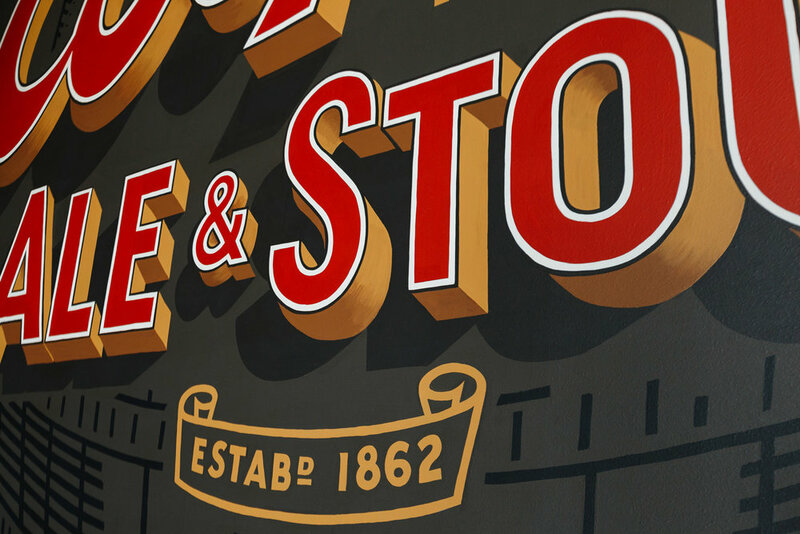 He was asked to reinterpret their current advertising, branding and hand-painted signage and create a large mural for their Alehouse entrance. 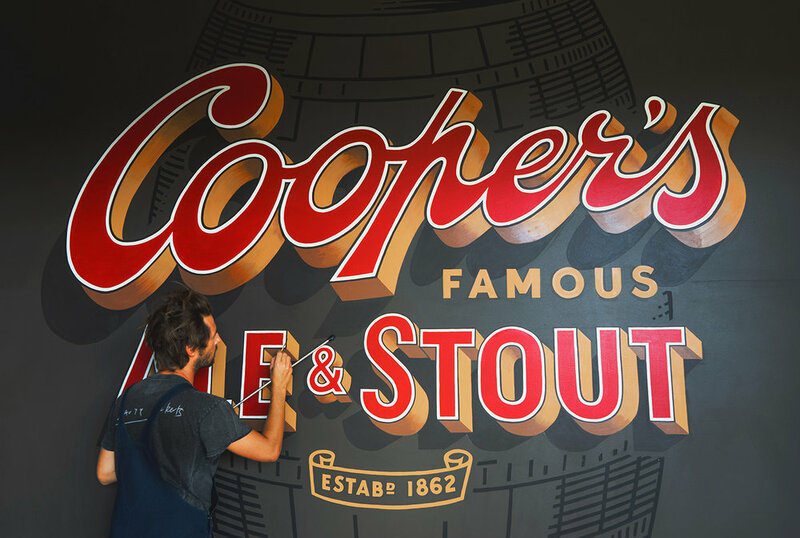 The “Cooper’s Ale & Stout” mural was part of a larger project which included several murals and gold-leaf signage (as seen in the video). The mural measures nearly 4 meters (about 13 ft.) wide by 4 meters high using acrylic paints. It took Tristan a week to prep the design and an additional week to produce the mural with the help of two assistants, Francois Morel and Vincent Audoin, from France. The most challenging component Tristan faced was having to paint on site during construction of the Alehouse. He was surrounded by several construction workers and by large amounts of debris and dust, which often forced Tristan to repaint several areas of his work. Tristan has been doing murals for about six years. He gravitated toward public and mural work after traveling through Europe and connecting with different urban and post-graffiti artists. Tristan Kerr is an esteemed artist and typographic designer based in Australia. After working in Switzerland as a print technician in a renowned screen-print studio and as a designer in Paris for several years, he discovered his passion for typography, urban art and the revival of the decorative arts movement of hand sign-painting. His commissions span from hand-painted advertisements for Penfold’s wine to murals for Red Bull Music Academy to assisting illustration projects for Hermés, Paris. Visit Tristan at tristankerr.com.au or on his Instagram @tristan_kerr. Sign up for our newsletter and be the first to learn about Goodtype happenings.